More than 60 pilot whales died in a mass stranding at a remote New Zealand beach, conservation officials said Wednesday. 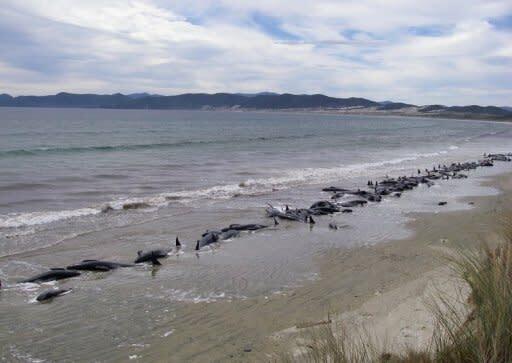 Tourists found the pod of 61 beached whales on Monday at Farewell Spit, on the top of the South Island, the Department of Conservation (DOC) said. DOC local manager John Mason said a large number were already dead and hopes the survivors would refloat at high tide on Tuesday were dashed when the whales swam back to shore. He said 18 whales remained alive early Wednesday and DOC staff decided to euthanize them, rather than prolong their suffering. "It's the worst outcome and it's not a job our staff enjoy doing at all," Mason said. Pilot whales up to six metres (20 feet) long are the most common species of whale in New Zealand waters, with mass standings occurring about two or three times a year. Scientists are unsure why pilot whales beach themselves, although they speculate it may occur when their sonar becomes scrambled in shallow water or when a sick member of the pod heads for shore and others follow.